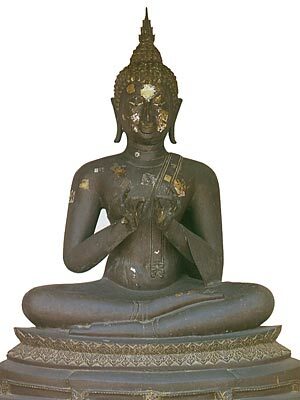 Thai Buddha Images : Gestures and Postures of the Buddha. Buddha images of different historic periods in Thailand. 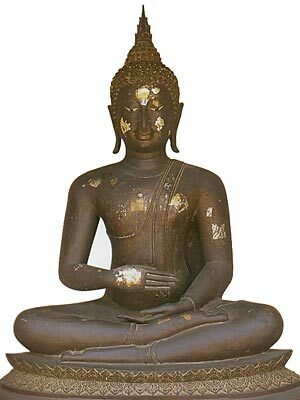 The Buddha makes a gesture of dismissal with his right hand, while his left hand rests in his lap. 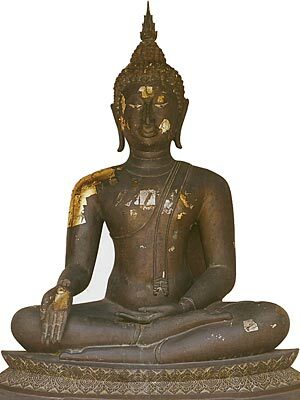 The Brahmin Vakkali was impressed by the physical appearance of the Buddha. The Buddha told him that he should not be impressed by physical appearance (that will decay later anyway), but be a follower of the dhamma. 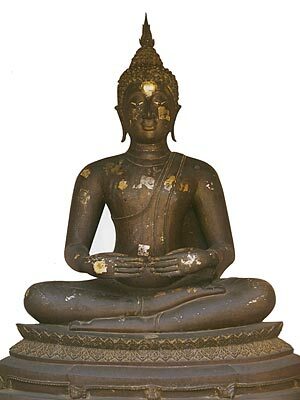 The Buddha has his two hands in front to the chest, concentrating on threading a needle. The Buddha is making a robe from rags picked up from a corpse. While doing this and concentrating in threading, he got further insight and came to realize the last of the Four Noble Truths, namely the Eightfold Path. The right hand is pending in vada mudra. When standing the left hand will clasp the edge of the monastic robe. No particular story attached. It denotes the altruistic quality of the Buddha. Someone has bad intentions towards the Buddha and sends his elephant Nalagiri to do harm. However, the Buddha tames it. The right arm is lifted to waist level with palm down. Content by Guido Vanhaleweyk, Bangkok.